Hudson Valley Flying Circus | FLYING CIRCUS BBQ MEET ….. FUN & RECORDS GALORE !!!! FLYING CIRCUS BBQ MEET ….. FUN & RECORDS GALORE !!!! It was a happening !!! The 2016 Circus Barnyard Meet was filled with UNBELIEVABLE ATHLETES…FRIENDS….SPIRIT and FUN !!! They say that a gathering of pole vaulters is a dangerous situation that sometimes needs security….. but… this gathering was about belonging and friendships. Thank you all..athletes..volunteers ..coaches and family for a super enriched day at Flying Circus !!! Onto the BEACH VAULT !!!!! ….. Here are some of the NEW RECORDS from BBQ Meet. * 7 New Meet Division Records !!!!! * Record 37 Personal All Time Personal Best Performances !!!! * Record… 11 Water-Mellons Consumed….Easily!!!!! * 3 Runways At the Same time with LAUGHTER ABOUNDING !!!!! * BEST MUSIC ..ON -the-PLANET !!!!! Girls AM Meet ( 47 Girls) Prizes donated by Jerry Cahill’s You Can Not Fail Foundation and Katherine Duffy’s State Farm Insurance !! The Fireworks was lit by Chloe Pasek(West Milford,NJ) winning the Elementary School Championship at 7′ 6″ Meet Record…It shifted to Genevieve “Sunshine” Reilly (Warwick,NY) taking the Middle School crown at 9′ 6″… then all eyes were on Francesca Porambo(Basking Ridge,NJ) winning the Frosh/Soph Division at a meet record 11′ 0″ for her coaching dad Carl…The High School Division of Girls came down to Governor Livingston,NJ junior..Leah Saifi setting a New BB Record of 12′ 2″ to edge Wilkes Barre,PA Junior Madisyn Hawkins who also blasted over 12′ 0″…. The Open Women’s gold went to Emily Shipley(Hillsbough,NJ) at 12′ 0″ and Flying Circus Wonder Stephanie Duffy won the Coaches Division at 12′ 0″ by a ton..then retired!!!! Elementary School – Chloe Pasek(West Milford) 7′ 6″ Meet Record!!! Boys/Men’s Meet..PM…In the Heat of the Day!!!! record of 6′ 6″ for the family sweep!!! Elemantary School – Jake Pasek(Mawah,NJ) 6′ 6″ Meet Record!!! CONGRATULATIONS ATHLETES !!!!! THANK YOU VOLUNTEERS !!!!! CONGRATULATIONS to Flying Circus Alum…MEGAN CLARK for her SUPER OLYMPIC TRIALS 15′ 1.5″ LAUNCH and yesterdays’ GOLD MEDAL for USA Under 23 CHAMPIONSHIPS in Santigo,Chile!!!!! 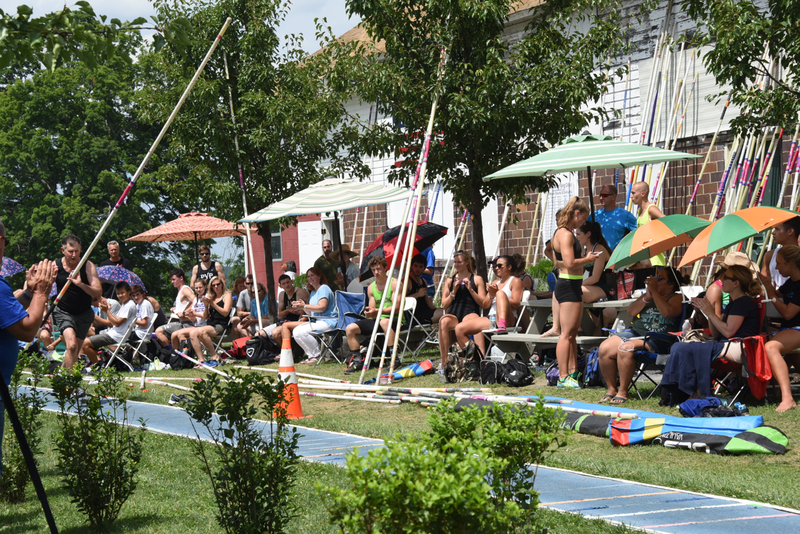 FLYING CIRCUS… Pole Vault Fun !! !